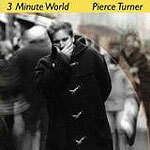 "3 Minute World" is the new album from former Hot Press solo performer of the year Pierce Turner. Although based in Manhattan, he has built up quite a following over this side of the Atlantic as well. His songs are those of one displaced geographically and lyrically show a view of Ireland from Manhattan. Tinged throughout with references to God and Christianity, the album opens with 'Sunday' and its refrain of "no one tangles with God". Each lyric is strong and the songs mark steps in his life. Each song is a story. Track eight 'Ball and chain (Snakes and Ladders)', the strongest potential single, shows how he has come to accept the life he leads. He wants to live the life of a musician, but refuses to give up everything else for it. Overall, this is okay, but at times it does sound like he is fronting a cabaret band, or should be opening for Daniel O'Donnell. The instrumentation works well but his voice is possibly his biggest weakness.